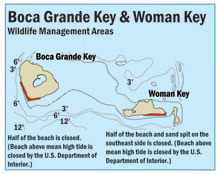 This Key West National Wildlife Refuge island is 13 miles west of Key West just east of Boca Grande. Crystal clear, shallow-water flats border an extensive south-facing beach and dunes. Half of the beach, as well as the sand spit on the southeast side, are closed to protect wildlife. Loggerhead turtles nest on the beach and dunes. Several species of wading birds also nest in the area and a large number of shorebirds use the sand spits on the southeast side of the island.